The continuation bet is one of the more common plays in poker and is a prime example of how aggressive play can be used effectively. However, it’s not always as simple as just betting all your flops and knowing the proper time to use is will make it a very potent weapon in your strategy arsenal. A continuation bet is when you raise a pot pre-flop and then continue to represent strength after the flop by betting it out, regardless of the fact that you may have missed the board entirely. To make the bet effective, it must be a sizeable bet equal to at least 70 percent of the existing pot. Any time you can force your opponents to make a tough position, you’re playing good poker. The fact of the matter is that the fewer players involved in the pot, the more likely the chance of all players missing the flop. Couple that with the natural notion that the pre-flop raiser has a strong hand, and you can start to see how powerful the move can be. As you can see, a continuation bet is going to be more effective with fewer opponents. In fact, when you’re heads-up against another opponent, you’re going to want to use it more frequently as it’s almost a 2/3 chance that your opponent did not improve. 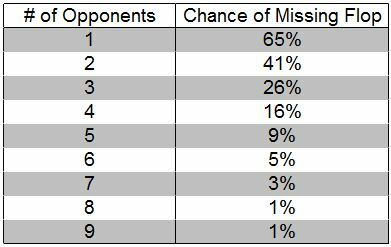 Your opponent is a calling station – if you’re able to identify these types of players, it’s important to remember that bluffs are less likely to work. Out of Position – playing out of position is often difficult and should be generally avoided without premium hands. The more frequent you use the continuation bet when out of position, the more likely you’ll get called down. Multiple Callers – as the chart above shows, the more callers involved in the pot, the more likely someone will have connected and therefore your fold equity will diminish greatly.